We started school on Monday and thought you would like to see how we looked in all our new clothes and shoes. Enjoy them now, cause they will dirty in no time! 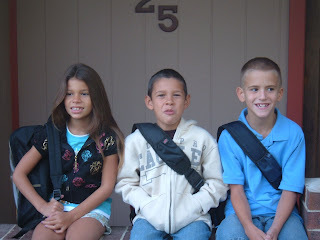 :) Brandon is in 1st grade, Summer is in 2nd, and Timothy is in 3rd! I am still in 5th, however I guess I finally learned all the math because this year I will be teaching language arts, reading, and social studies! I wonder how long it will take me to learn all these subjects! 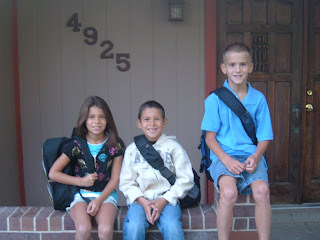 Hope your first day of school went well! Your kids look so cute! They all look so nice and well behaved...at least for today! Maybe someday you will get to graduate from 5th grade, if you study hard!